Last time we talked about making basic round links and cutting them, and three of the most basic and common chain patterns. After I wrote that, and posted it, I realized that I had forgotten one of the coolest pre-1600 chain patterns – the twisted chain. Now this chain pattern differs from all the other patterns that I have mentioned in one very important way. The pattern has to be created as a continuous loop. It depends on the tension that is created by the loop of the chain to create the twist in the chain. Now I confess, I am not going to try to teach you how to create this chain, but I will show you a picture of it. I purposefully chose two chains made from different sized links to show how different the chain can look, depending on the link size. Some of you are probably wondering why I have not mentioned the infamous Byzantine chain. I have had this conversation with several very serious researchers, and the reason for all of us is the same. We can’t find an example of a pre-1600 Byzantine chain. Now this could change at any time of course, but for now. The Byzantine chain, as cool as it may be, is NOT on my list of pre-1600 chain patterns. So back to what I was supposed to be talking about – shaped chain links. I am going to divide this category into two parts, links that start out as rounds and are changed in some way, and links that may never have been round. Now, that may sound a bit vague, but I think it will make sense in the long run. The most common “used to be round” links are used in a technique called Loop in Loop. It starts the same way, wrapped wire on a dowel, and then the wire is cut to create a link. And here is where everything changes – instead of just closing the link with a couple of pairs of pliers and using it, the link is closed, and then it is soldered closed. The link is then formed, and the formed links are woven together. When I do this in my shop I actually use a pair of pliers to stretch the individual links. 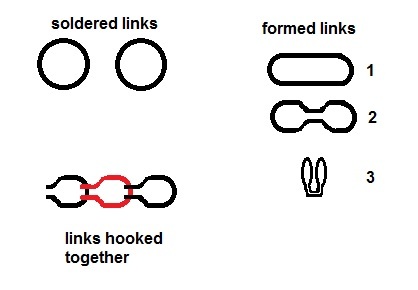 There are many different shapes that the links can be formed into. This diagram shows the simplest form of this chain. This chain is very strong because the links are soldered and more than one wire goes through each link connection. This type of loop-in-loop forms a very simple linked chain. The actual shapes of the wires can easily be seen. 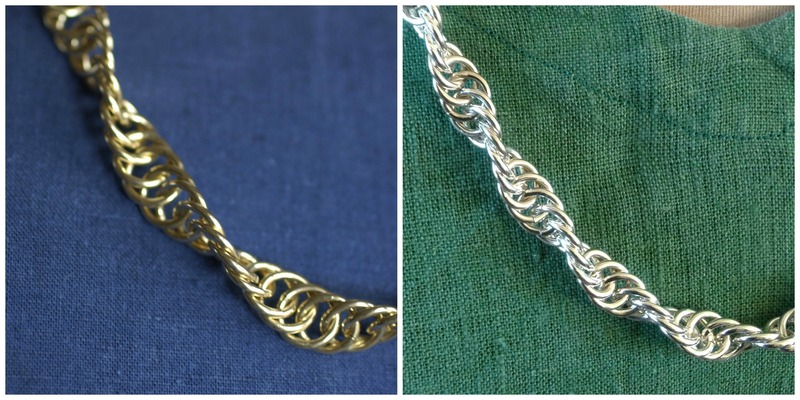 But more complex forms of this chain can create very complex interwoven shapes that actually resemble wire weaving. A considerable number of the modern Balinese silver chains, the ones that almost look like a snake chain, are made this way. I found an example of a Roman chain at the Metropolitan Museum of Art that shows the form of the loop beautifully. If you click on the four arrows it will make the picture full screen. And yes, this was a very lucky chain because it had both a crescent and a phallus pendant on it. And this Greek necklace is a much finer version of a loop in loop chain. Next time – what sort of other shaped chains do we find? This entry was posted in Jewelry, Metal Working and tagged Greek chains, loop in loop chain, making chains, medieval chains, Roman chains, Viking chains by Eirny. Bookmark the permalink.